What most of us don't know about our presidents could fill a book--and this just happens to be that book. From the archives of The History Channel® comes a treasure trove of quirky presidential history that will truly astonish, bewilder, and stupefy. Like Abraham Lincoln's duel or Jimmy Carter's UFO sighting. And let;s not forget about the president who went skinny dipping in the Potomac every day. 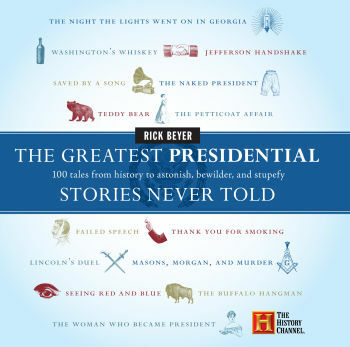 That's the kind of presidential history you'll find in The Greatest Presidential Stories Never Told: One hundred little-known stories to make you shake your head in wonder. If you want to find out how "Hail to the CHief" came to be the president's song, why the Oval Office isn't square, which president saved the game of football, and why Washington, D.C, could have been named Hertburn, this is the book for you. € The custody battle that made George Washington an American? € The counterfeiters who tried to steal Lincoln's body? € The woman who brought down Andrew Jackson's cabinet? € The man who was president for a day. You know what makes the presidents famous, but it's the stuff you don't know that makes them fascinating!